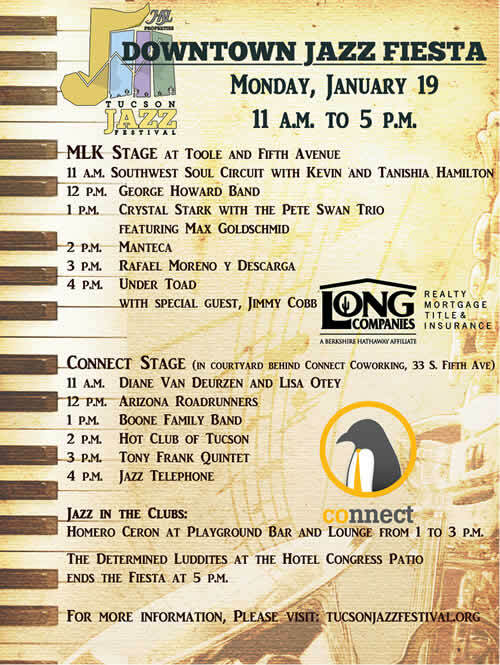 The mission of the first HSL Properties Tucson Jazz Festival is to present jazz of all genres, to bring thousands of people to historic downtown, and to attract new winter visitors to sunny Tucson. The festival runs from Friday, Jan. 16 until Wednesday, Jan. 28, 2015; the average daytime high temperature during that same time in 2014 was 74.5 degrees. The Festival is, primarily, a downtown event with locations at the historic Fox and Rialto theatres. A free outdoor Downtown Tucson Fiesta will be held on Martin Luther King Day, Jan. 19, with two stages featuring local musicians. "We’ve lined up some of the very best jazz artists from around the United States and locally," said Yvonne Ervin, Executive Director of the HSL Properties Tucson Jazz Festival. "There will be a little bit of something for everyone, and January in Tucson is the perfect time of year to enjoy and celebrate jazz music!" "The intention is to bring thousands of people downtown, increase use of the streetcar, and attract tourism during the winter season," said Tucson Jazz Festival Steering Committee Member Elliot Glicksman. 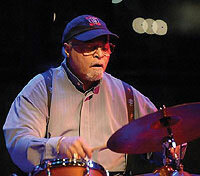 The special guest artist for the festival is drummer Jimmy Cobb, who will turn 86 during the festival. An NEA Jazz Master, Cobb is the only living member of the Miles Davis band that recorded "Kind of Blue," the most popular jazz album in history. 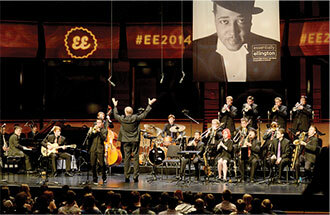 Cobb will perform with the Tucson Jazz Institute award-winning Ellington band and the Joey DeFrancesco group at the opening concert (Jan. 16). Alumni of the TJI Ellington band will appear with the big band: Arco Iris Sandoval, piano, who is making a name for herself in NYC, Alex Weitz, saxophone, who has composed a piece for the band, and popular local favorite, Max Goldschmid who plays everything! Highlights of the festival include a unique performance on Jan. 24 by jazz pianist Billy Childs as special guest with singer/songwriter JD Souther, who is best known for penning hits for the Eagles. The Grammy Award-winning Robert Glasper Experiment, whose crossover hit "Black Radio" won for best R&B album in 2013, will take the stage at the Rialto on Jan. 17. Jazz vocalist Allan Harris will sing a Tribute to Nat "King" Cole at the Fox Theatre on Jan. 25; the opening band will be the Tucson Hard Bop Quintet (featuring trumpeter Jason Carder and saxophonist Brice Winston) with special guest, guitarist Dave Stryker. Two UA Presents jazz shows at the Fox Tucson Theatre, with vocalist Dianne Reeves and The Hot Sardines, are included as part of the festival lineup. In a special arrangement with the Consul of Mexico in Tucson, the festival will present International Contemporary Jazz with Aguamala at the Rialto Theatre on Jan. 22. The festival will be promoting "Jazz in Jan" for the entire month beginning at midnight on Jan. 1, with "Rick Braun’s New Year’s Eve" at the JW Marriott Starr Pass Resort. The festival will also support local jazz at restaurants and clubs in the two weeks leading up to the festival kick-off. Musicians who grew up in Arizona and are making their careers in jazz in New York City and elsewhere will be featured in special concerts: pianist/vocalist Rachel Eckroth, saxophonist Tony Malaby, and flugelhornist Dmitri Matheny. Eckroth plays in The Meredith Vieira Show’s house band on NBC, and she released an album titled "Let Go" earlier this year. The festival will end on Jan. 28 with a special joint production between the Rialto Theatre and the Festival: the legendary composer of pop and jazz standards, Burt Bacharach, will take the Fox stage with his 11-piece ensemble. 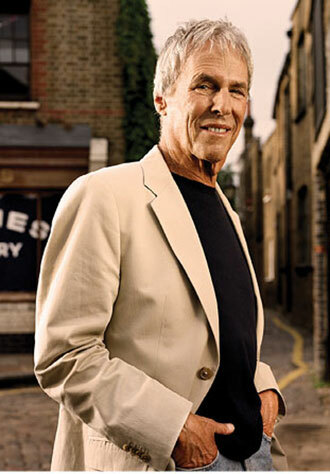 Bacharach has written more than 600 songs, and more than 70 Top 40 hits; the 86 year-old is known as one of the great melodists of the 20th century. Information can be found at tucsonjazzfestival.org or call 520-428-4853.